Dara, the pictures of your vacation are STUNNING!!! I think the next time you go away, I will pack myself in your suitcase. What a wonderful way to celebrate your birthday. I want to move into the Soleil, even though you said it is a restaurant, I loved the look. Today I was a princess. Feather, that is. The speaker at the meeting (of my applique quilt guild) was a former nursery school teacher. She presented a quilt show of quilts made from the handprints of the children in her classes. The handprints were made into animals, hearts, baskets etc. The quilts were adorable! Unfortunately there aren’t any good pictures of her quilts on her website. I returned this quilt to Miss Emily. 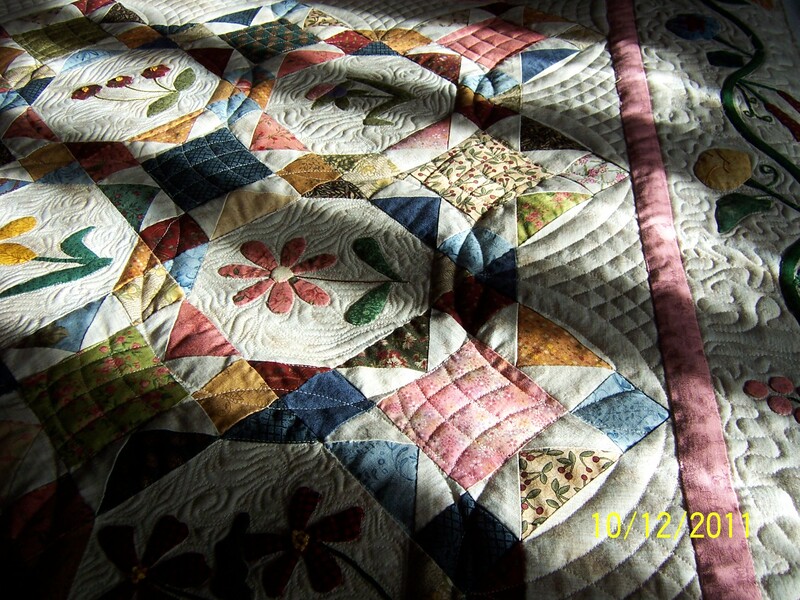 It is a beautiful appliqued quilt. This is a close up. I am still struggling with taking pictures that show my quilting. I think the sunlight helps show the texture, maybe I’ll pretend the shadows add atmosphere. Miss Emily was happy with the quilting, which means the most to me.